The National Association of Community Health Centers (NACHC) joins the nation in paying tribute to a champion of America’s Health Centers and one of the giants of the U.S. Congress. 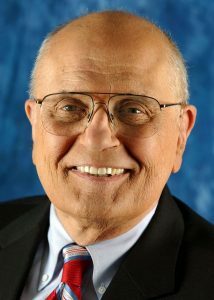 Former Congressman John D. Dingell of Michigan passed away on February 7th at the age of 92. In his long life in public service, nearly 60 years in the U.S. House of Representatives, John Dingell exemplified the highest qualities of integrity, leadership, and commitment to the public interest. He embodied the word – “public servant”. A master of the legislative process, his imprint was on all the major enactments of the last half century which he helped craft and move forward including Medicare, Medicaid, the Affordable Care Act, the Clean Air and Water Acts, the National Environmental Protection Act, the Endangered Species Act and many others. His influence in the shaping of legislation stemmed from years of experience and his ability to work across party lines and craft compromise. No less it stemmed from the broad jurisdiction of the Energy and Commerce Committee over which he presided as Chair for some 16 years. The jurisdiction of the committee spanned and covered the environment, health, energy, consumer protection, telecommunications. John Dingell was elected to the Congress in 1955, succeeding his father, John Dingell Sr, who served in the House for 22 years. In the tradition of his father, who introduced the first legislation calling for universal health care during the Truman Administration, Dingell each year would reintroduce legislation challenging the nation to make health care a basic right of all people. The NACHC family is indebted to Congressman Dingell who believed in health centers from the beginning and supported the growth of a strong community-based system of primary care in the nation. His legacy and his proud public service will live on inspiring new generations and upholding the values and traditions of our democracy. John Dingell retired at the end of 2014. He was one of the last veterans of World War II to serve in the U.S. Congress. He will be interred in Arlington National Cemetery. Our condolences to his wife, Deborah Dingell, who now represents his constituency in Congress and carries forward his legacy and work.